The German metallers AXXIS are back with a brand new album called ’Utopia’... an album fans of the band can buy blindfolded. 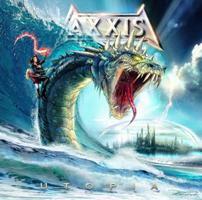 Sound and style wise AXXIS continues where they left us with ‘Paradise in Flames’ (2006) and ‘Doom of Destiny’ (2007) namely with heads down heavy metal with a symphonic edge. The CD is beautiful crafted but lacks surprises in my humble opinion. There is not ONE single filler to be found but every single song could have been found on their last two albums. But why shouldn’t they stick to what works? Just like on ‘Paradise in Flames’ and ‘Doom of Destiny’ we get both mid-tempo and up-tempo songs... and of course a ballad. The songs contain catchy riffs peppered with memorable choruses so the members of the band should congratulate themselves on a job well done. The very first time I gave this album a listen I was kinda disappointed. I felt I have heard it all before but after a few listens the songs began to grow... and grow. Even though ‘Utopia’ is a winner I’m not sure it will gain them any new fans... but fans of the band won’t be disappointed.